Announcing this year’s Installation Dinner Entertainment, Adam Ferrara! 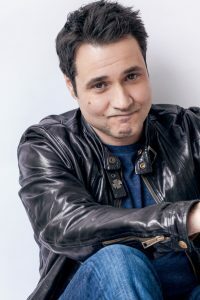 Adam Ferrara, the actor and comedian who Entertainment Weekly dubbed “Hilarious,” hosted the critically acclaimed BBC sensation, Top Gear USA. Additionally, Adam is an internationally touring headliner, two-time nominee for best male stand-up by the American Comedy Awards, and has three Comedy Central Specials. Ferrara proudly played Chief Needles Nelson on the Emmy® nominated FX drama Rescue Me with Denis Leary, and Frank Verelli on Showtime’s hit series Nurse Jackie, opposite Emmy® Award winner Edie Falco. He has also costarred alongside Kevin James in the hit movie Paul Blart: Mall Cop and in Definitely Maybe with Ryan Reynolds. Don’t miss Adam Ferrara’s performance at the PORAC Installation Dinner on Saturday, November 18th!